I get a lot of letters with requests about how I make the slipper cookies. The video on how to make lace like that you can find here. Thanks to SweetAmbs! I love it! For roses I used #16 tip. I love these slippers.. too cute thanks so much for the share. Hii is it modeling chocolate that u have used ... Would love to try these out ...beautiful work ! Que gran idea, esta maravillosa gracias por compartirla ¡¡¡¡¡¡¡preciosa!!!!!! Thank you so much!! 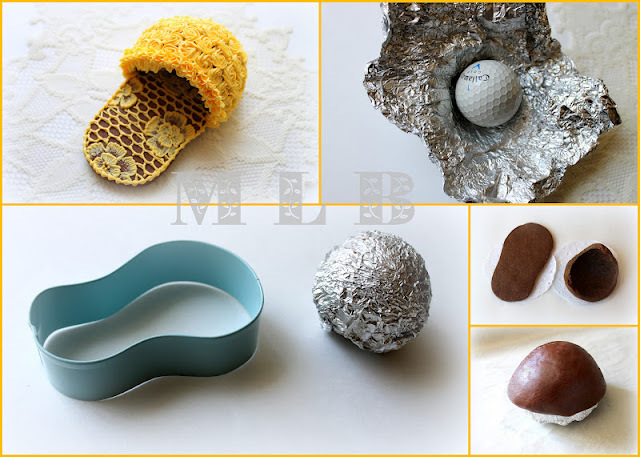 I'd imagined lots of things to use- but a golf ball was not one of them!!! You are so creative!!! So cute Nadia!!! What a creative use of the lace and brush embroidery! Okay I'm confused a little... Did you bake the golf ball? So just to clarify, the slipper is not made of modelling chocolate, but of chocolate cookie dough ? The base and top are each baked separately and then assembled with royal icing ? Could you tell me where you got the actual slipper cutter? The blue shape bit?.... Thanks! parabens muito lindo,obrigada por ensinar!!!! So cute! Is the cutter meant to be a slipper?? Or is it a shape of something else? Thanks! Sorry for the confusion...I see that it is a cookie cutter...I have never seen a "slipper" cookie cutter. I think I figured out it must be a flip flop base?? ?